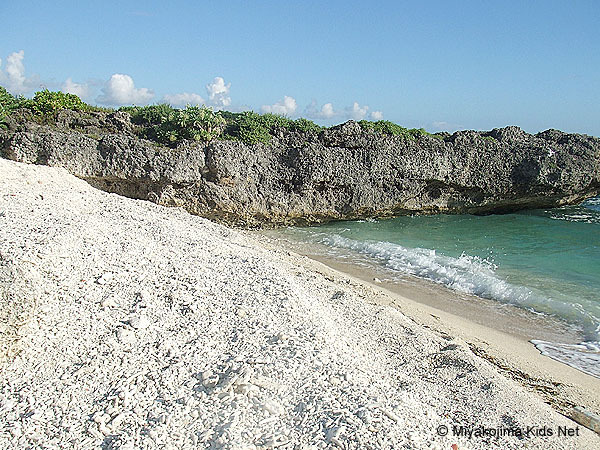 Miyako Island's main attraction is their pure white sand and glistening blue sea. The island is also surrounded by beautiful coral reefs. Sadly, many of those beautiful coral reefs have been experiencing a disaster called coral bleaching for years. 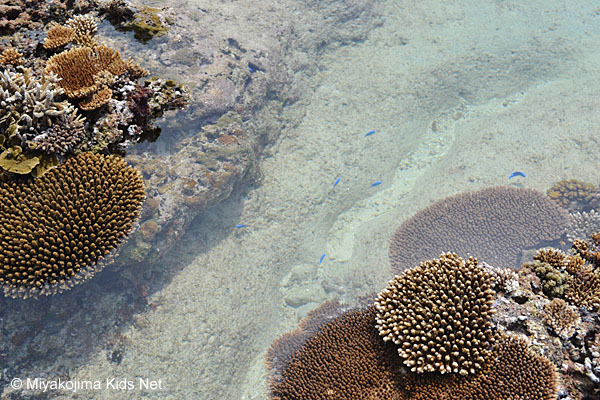 Here are the healthy and vibrant corals of the ocean. Corals house small fish and protect many of them from their bigger predators. 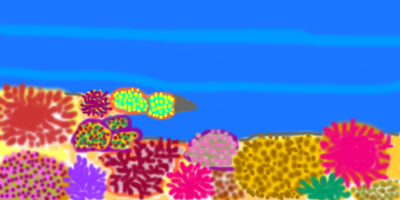 There are many beautiful corals with the colors; red, purple, pink, orange, and yellow. 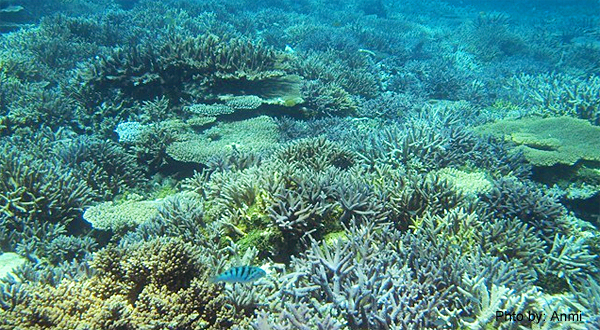 Yabiji (yah-bi-ji) is made of more than 100 coral reefs located near Ikema Island. 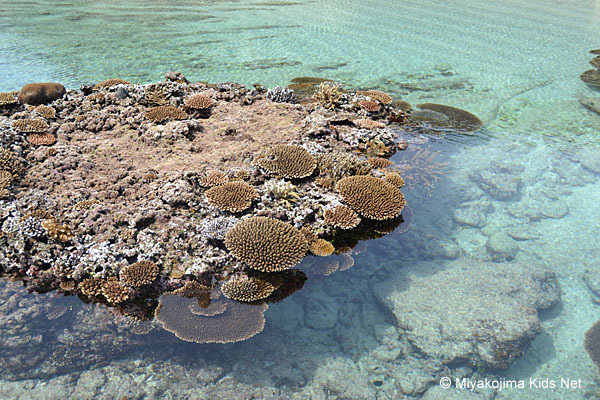 It is the largest coral reef group in Japan. 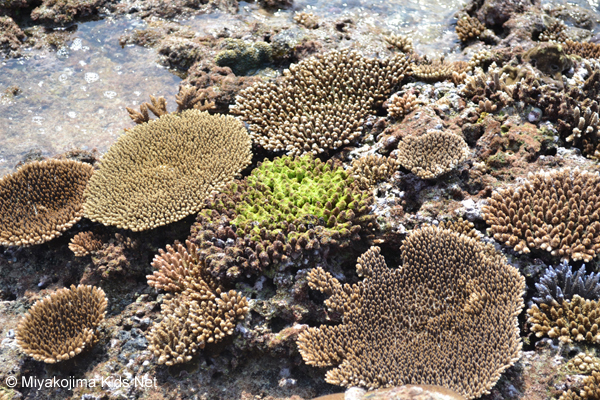 Usually, the corals are underwater, but they appear above the ocean a couple of times during the spring tide. 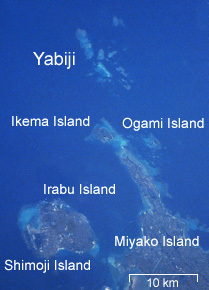 Yabiji is one of the most popular tourist spots in Miyako island. Yabiji is called "Illusional Land" because of their rare appearance or "Flower Garden of the Ocean" because of their color and variety. During the second week of April, the spring tide sweeps in when the Sun and Moon align with the earth. This causes their gravitational pull to become the greatest in the year. Due to the gravitational force affecting the tides, the level of water surrounding the Yabiji atoll becomes very low, to the point where the whole atoll emerges from the ocean. This is the reason why the Yabiji is called the ‘Illusional Land’. Unfortunately, these illusionary extravaganzas of the ocean are often threatened during their time on the surface. Each year when the spring tide arrives, many tourists visit those Yabiji atolls to take part in some sightseeing activities. While this may seem like an innocent act of observing the pieces of the atoll close up, what the tourists are doing is stepping foot onto the Yabiji and damaging the corals. 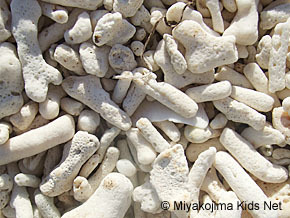 The Miyakojima Tourist Association is saying that “Coral walk is a controlled landing excursion that only takes place for a few days”, which also translates to the fact that the Okinawa prefectural government and the City of Miyakojima are allowing this to happen. During these seemingly insignificant three days, there are about 1,500 to 1,800 tourists walking on the tops of the corals for one to two hours. Thinking about the deep bruising and the actual rate of growth of the corals, even a couple of days a year can be critical. Due to copyright infringements, we cannot show you the pictures on this website, but you can see the many pictures of the tour activities that take place on the coral reefs of Japanese Google image page. It is our proposition to stop the “Landing excursion tours on the corals (Coral Walk) ” immediately and all of the tourist activities should be limited to only “observe by ship”. Here are the dead corals that are washed onto the shore. How does coral bleaching happen? 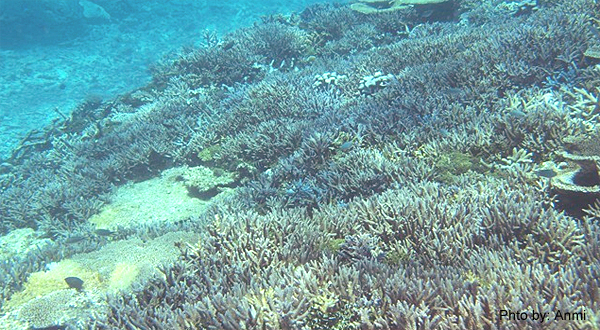 When the sea temperature rises 2°C above normal, the corals get damaged. 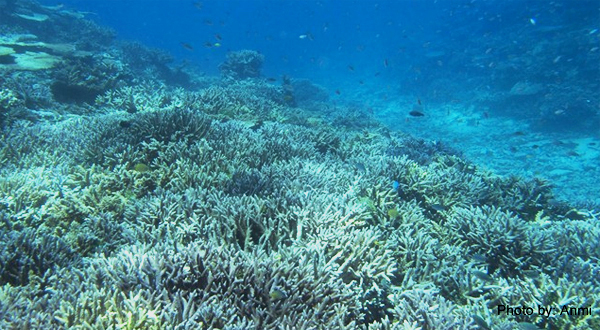 This is the most common way for coral bleaching. As the corals' worst enemy, the acanthaster starfish has the corals for breakfast, lunch, and dinner, wiping out whole populations of coral reefs. One acanthaster starfish can eat up to 5-13 square miles of coral reefs per year! During periods of abnormally rapid growth, the large groups of acanthaster starfish move together and spread across the surface of coral reefs. Farmers use chemical fertilizers and pesticides to protect sugar cane fields from disease. 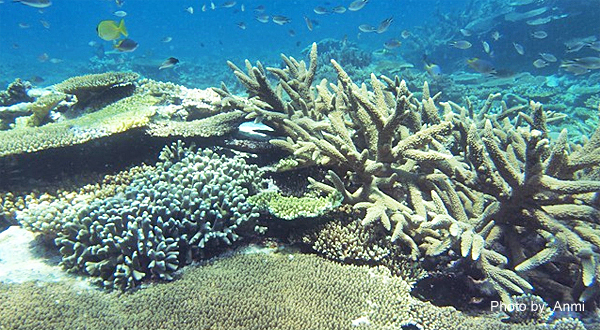 Unfortunately, those chemicals flow into the ocean with rain water and weakens the corals. 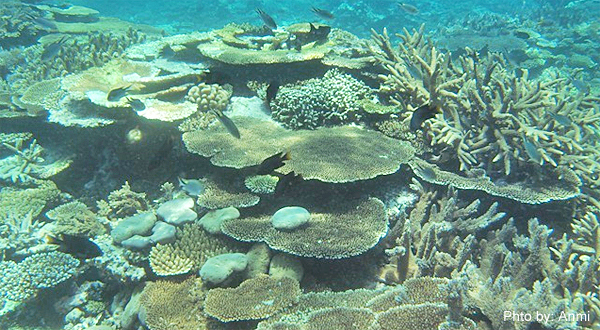 Tourism related activities are often a big threat to the coral reefs. urgently be stopped as stated on this page. 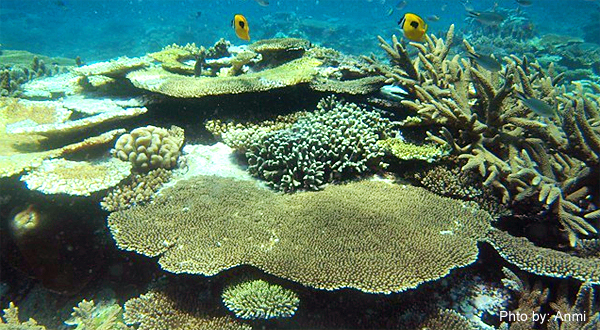 result in further destruction on the coral reef and the surrounding ecosystem. 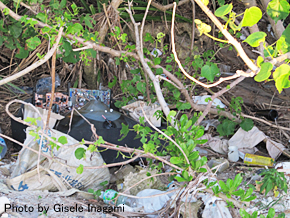 An unbelievable amount of trash has also been deliberately thrown throughout the islands. farming and fishing were dumped illegally last year. 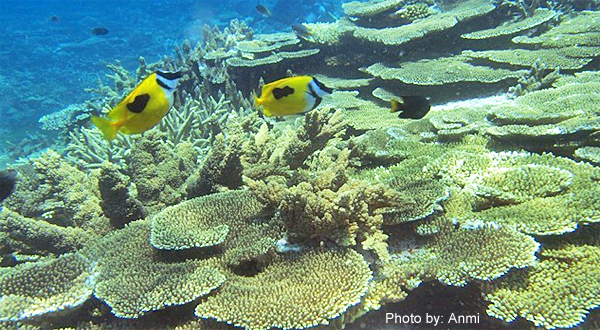 The corals you see in this video are from the project, "Save the Beach Assets". 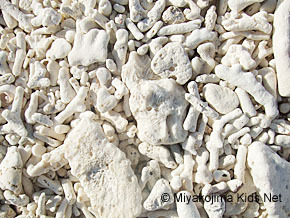 All corals were made with water soluble glue and have been returned to their proper beaches after being photographed. Enjoy! 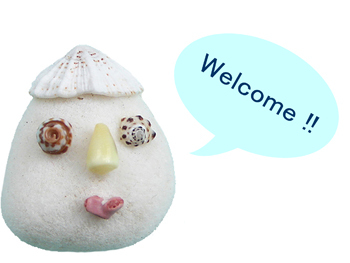 Copyright © 2010 - 2015 Miyakojima Kids Net. All Rights Reserved.